John Sedgwick, often called "Uncle John" by his men, commanded the VI Corps, Army of the Potomac. During the Battle of Gettysburg, Sedgwick's Corps was held in reserve, and units were assigned, as needed, to other corps. 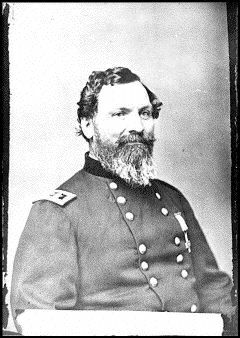 In effect, Sedgwick was out of a job during the battle prompting him to remark, "I might as well go home." Sedgwick was killed in 1864 at Spotsylvania. After admonishing one his men who was hiding from Confederate sharpshooters by saying, "They cannot hit an elephant at this distance," he was shot through the head and died instantly.